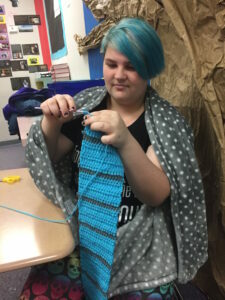 In Koni McLean’s AVID College Readiness class at Wenatchee High School, students spend an hour every Thursday morning knitting hats to be given to youngsters who need them in our community. The young men and women of this class chose to make this a weekly part of their school routine because it helps them relax, use their creativity and because it is a way of giving back to the community. On the day I visited the class, friends Julio Gutierrez, Cesar Ledesma and Giovonnie Arguelles were huddled together working on hats. These hats start with a round form and, using donated yarn from the community, they work on their creations until they are done. When it is done, the Hat Lady, retired social worker Aida Bound, makes sure the finished garments get in the hands of kids who might not otherwise have one. 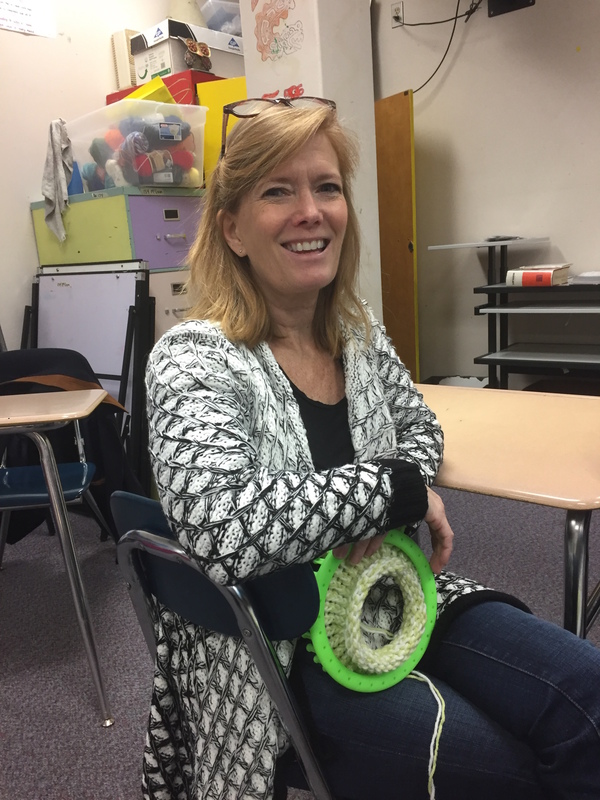 She’s got groups of people all over the community and beyond knitting hats to help others. Gutierrez remembered getting a similar knitted hat in the fourth grade from this community-wide project, so knitting a hat in class for others helps him pay it forward. But he told me knitting is also a great way to relieve stress. I heard these themes repeatedly. These students love doing something for others and they enjoy the tactile experience of creating something with their hands. Ledesma said he started making hats as a way to fulfill community service hours and he thought it would be difficult to learn. But he discovered to his surprise that knitting hats is “pretty easy.” Know that the end result will warm the head of a youngster makes him happy. 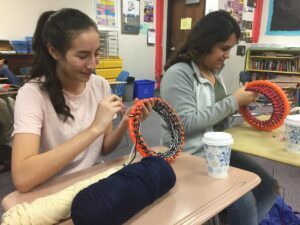 Nearby, friends Daniela Garibay and Maria Rodriguez were busy working on their creations. One of the payoffs is when they see pictures of smiling kids with hats they chose. “It’s really nice to see how happy they are,” she said. Rodriguez is an experienced knitter who learned at an after-school knitting class at Pioneer Middle School. This has become a part of her life at home and she’ll often make gifts using her hands. Both Rodriguez and Garibay are planning on careers in nursing. I also talked to Monserrat Demano, who was making pom poms for hats. She said she wasn’t too keen on the project at first but found that it “helped me take my mind off of stuff at school. 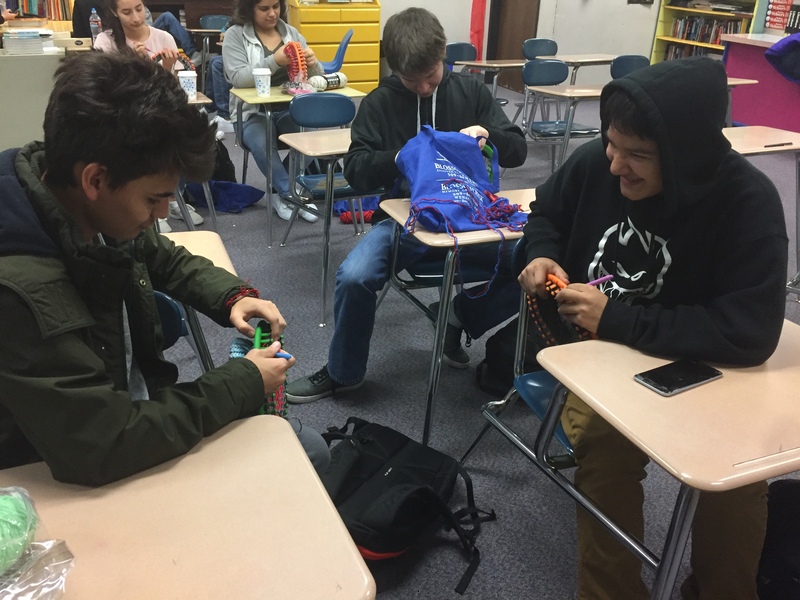 Students Christian Vazquez, Arturo Sanchez and Cascade Crum shared their experiences as they made hats and other articles of clothing for the Hat Project. Rather than knitting her garments, Crum crochets, a skilled she learned from her grandmother. The students learned how to make hats last year and chose to make this a regular part of their experience in Mclean’s AVID class. AVID provides a wonderful opportunity for kids to work together on their future and on dealing with the day-to-day stresses of mandatory tests and other school struggles. McLean is over the moon about “how tenacious these kids are” and how they develop close bonds because they are together for their entire high school experience. “They are there for each other more than they are there for themselves,” Mclean told me. Most of these kids put on a smile as a mask when they come to school, but through the shared experience of AVID, they sometimes will allow her and their classmates to see what is deeper inside them. What I appreciate about McLean’s perspective and the AVID program in particular is that it builds confidence through shared experience. McLean speaks of teaching the whole student rather than compartmentalizing and that key concept is catching on not only in schools but also in the community as a whole. There are lots of frustrating days for these students, she acknowledged, but those trials and tribulations ultimately lead to those “awesome” days when students sense their true capabilities. This group has been with her since their freshmen year. Freshmen are “scared they are going to die,” sophomores have their struggles, but by the time they are juniors and seniors there is a significant resilience — a growing sense of confidence and strength. They’ll need that confidence when they begin college. The rest of the week, the class does some more traditional work. One day is spent on checking grades, another on checking their binders. There is a big concentration on celebrating the successes of the students. McLean, on this day, was working on her own hat. Bound, who visits every Thursday to work with the students, said there is something beautiful about the fact that McLean is the worst hat knitter in the class. “I might be a little more challenged,” McLean observed. I so appreciated getting acquainted with the students and McLean as well as an opportunity to get a closer look at the AVID program.